It's 1949 and two young Cuban musicians make their way from Havana to the grand stage of New York City. It is the era of mambo, and the Castillo brothers, workers by day, become stars of the dance halls by night, where their orchestra plays the lush, sensuous, pulsing music that earns them the title of the Mambo Kings. This is their moment of youth, exuberance, love, and freedom—a golden time that decades later is remembered with nostalgia and deep affection. Hijuelos's marvelous portrait of the Castillo brothers, their families, their fellow musicians and lovers, their triumphs and tragedies, re-creates the sights and sounds of an era in music and an unsung moment in American life. 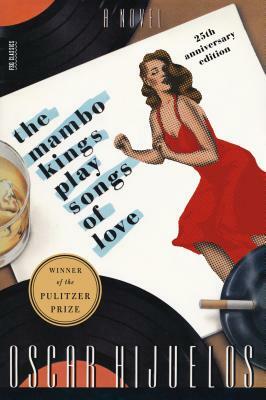 Exuberantly celebrated from the moment it was published in 1989, The Mambo Kings Play Songs of Love won the Pulitzer Prize for Fiction in 1990 (making Hijuelos the first Hispanic recipient of the award). It was adapted for a major motion picture in 1992 and remains a perennial bestseller. The story's themes of cultural fusion and identity are as relevant today as they were twenty-five years ago, proving Hijuelos's novel to be a genuine and timeless classic. Oscar Hijuelos was born of Cuban parentage in New York in 1951 and graduated from City College with a master's in creative writing, studying under the likes of Susan Sontag, Donald Barthelme, and William S. Burroughs. His first novel, Our House in the Last World, was published in 1985. In 1990 he became the first Hispanic writer to be awarded the Pulitzer Prize for Fiction. He is also the recipient of the Rome Prize in Literature from the American Academy in Rome, an Ingram Merrill Foundation Award, and the Hispanic Heritage Award for Literature, along with several grants from the Guggenheim Foundation and the National Endowment for the Arts. He wrote eight novels which, have been translated into more than twenty-five languages. He passed away in 2013.